In august 1990 Iraq invaded Kuwait and occupied the country for seven months. During this time many buildings were subjected to direct shelling or fire, or both causing extensive damage. Several case studies are presented to show the performance of masonry elements under such conditions. It was found that the masonry walls used in Kuwaiti construction were very resistant to the damage inflicted. Due to their high resistance to fire, they prevented fire from spreading to adjacent rooms and buildings. In buildings with a reinforced concrete skeleton, after the loss of supporting members, infill masonry walls acted as wall-bearing elements and kept the building standing, thus saving lives and enabling repair work to be carried out later. 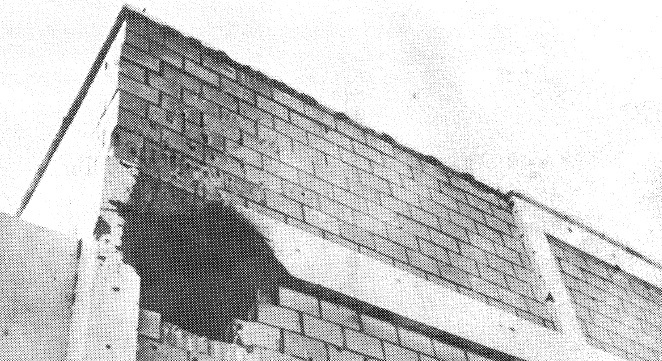 Concrete structures with infill masonry walls showed considerable resistance to both fire and direct shelling, while the resistance of steel structures was very limited.